I was just returning from a conference on “Secularisms and the Formations of Religions in Asia” when a colleague pointed out to me that I seemed to like conceptual discussions. Conference participants had presented a huge variety of insightful cases, ranging from the proliferation of Christian wedding churches in Japan to a newly secular constitution in Nepal. In the closing round, however, I made a plea for more theoretical reflexivity regarding the concepts in the workshop title – secularism and religion. It may be true that I like conceptual discussions (sometimes). My point in bringing up theoretical reflexivity in this context, however, was a different one, one exceeding personal priorities: if we keep “applying” (Western) theory to (Asian) cases, we implicitly reproduce a discourse that produces “Europe” as “the sovereign, theoretical subject of all histories, including the ones we call ‘Indian’, ‘Chinese,’ ‘Kenyan’ and so on” (Chakrabarty 2000: 27). The notion that concepts can be merely applied is itself embedded in a particular history and politics of knowledge production that needs to be problematized. Above all, we thereby continue to leave unreflected, and thus powerfully productive, the secular epistemology undergirding modern knowledge formations in general, and the sociology of religion in particular. Provincializing epistemologies, I will argue, therefore means in the first place to reflect on possibilities of provincializing secularism. The case I want to discuss is one of the most unlikely cases for discussing the secular in Asia: Thailand figures as a prominent example of religious nationalism in most academic accounts. This is particularly true when it comes to studies on the on-going armed conflict with the so-called Muslim minority in southern Thailand. Here, scholars have identified Buddhist nationalism as one of the main factors that continues to fuel the conflict. Historians have explained this conflation of the nation-state and religion in Thailand by outlining the constitution of Thai modernity as an alternative “Buddhist modernity” – a form of modernity putatively built on repudiating secularism. I want to challenge this assessment by going back to a historical example. This example will take us to 19th-century Siam (today Thailand), when the royal elite was negotiating the epistemic foundations of what was about to become a modern nation-state. In my current project, which I briefly touch upon here, I seek to produce an alternative reading of one of the most important sources of intellectual history from this period: the “Book about Various Things” (Nangsue Sadaeng Kitchanukit, hereafter Kitchanukit, 1867). Historians have largely read the Kitchanukit as documenting the epistemic shift toward Thailand’s alternative “Buddhist modernity”. I show, in contrast, that a secular conceptual grammar is key to the way the Kitchanukit configures “religion” in general and “Buddhism” in particular. What we can trace here, I argue, are the beginnings of the political project of “Buddhist modernity”, a project intimately tied to and animated by imperialism. In denoting the secular as a conceptual grammar, I am referring to an analytic suggested by the anthropologist Talal Asad. This approach is distinct from and critical of theories of secularization that have predicted the disappearance of religion. In the strand of secular studies inspired by Asad, crucially, the secular therefore does not describe the waning or absence of religion. Instead, it refers to an epistemic order that enables a particular way of governing religion in modern nation-states. Thus, scholars working from this angle have shown that specific notions of secular time, rationality, and subjectivity undergird the governmental techniques deployed by modern liberal nation-states in general and their governance of “religion” in particular. They have also argued that the secular operates as a powerful discourse whose very aspiration to separate the spheres of politics and religion continually produces their mutual imbrication. A number of critics have noted, however, that the large majority of theoretical concepts in secular studies have been developed by engaging secular formations in Euro-America. One popular strategy to overcome this bias follows the theory of “multiple modernities” and proposes to explore “multiple secularities” or “varieties of secularism” around the world. At first sight, the notion of “multiple secularities” has an obvious normative appeal that seems to challenge the Eurocentric narrative of a uniquely European secular modernity. Nevertheless, the notion of “multiple secularities” is problematic, in my view, for at least two reasons. It tends to erase the imperial geopolitical context that conditioned the “multiplication” of the secular modern through the proliferation of the nation-state form. And it effectively re-enshrines the teleological narrative of a uniquely secular European modernity by figuring its multiplicities as variations of a fixed musical theme originating in an imaginary West. The effort to provincialize secularism, by contrast, attempts to de-center Europe as the sole originator of secular modernity and lays bare the imperial context of a universalizing force that produced its own “varieties”. It also tries to bring into conceptual conversation those practices, traditions, and life forms that have come to constitute the Others of secular European modernity (and are thus marked by a powerful relationship of difference). Siam, for that matter, is a particularly fruitful place to start reflecting about conceptual possibilities for provincializing secularism. It was never directly colonized, and it bears complicated relationships to empire that have been described by awkward terms such as “semi-” or “crypto-colonial”. The genealogy of Siamese nation-state formation, moreover, cannot easily be mapped onto that of a liberal nation-state: once a Buddhist kingdom, Thailand is now a constitutional monarchy whose constitution paradoxically includes both the right to religious freedom and the necessity to have a Buddhist king. Last but not least, the example of Siam is revealing because we have to inquire into epistemic shifts occurring within a different religious tradition, one that was in the process of becoming a “world religion” toward the end of the 19th century. And in contrast to Islam, crucially, Buddhism was not constructed as the Other of Christianity, but discovered as the first universal world religion in 19th-century orientalist research. The case of Siam, in other words, challenges us to grapple conceptually with a number of questions. How can we conceptualize an epistemic shift to the secular in such a complicated setting, a context implicated in empire in ways decisively different from a direct colony? And what concepts allow us to de-center Europe as the sole originator of secular modernity while, at the same time, grappling with the universalizing force of imperialism that conditioned the production of its own particulars? I think that David Scott’s notion of the problem space might provide a useful basis to conceptualize the intimate relation of imperialism and a secular conceptual grammar without falling back on problematic theories of diffusion. In one of his formulations, Scott (2004: 6) describes a problem space as: an ensemble of questions and answers around which a horizon of identifiable stakes (conceptual as well as ideological-political stakes) hangs. That is to say, what defines this discursive context are not only the particular problems that get posed as problems as such (the problem of “race”, say) but the particular questions that seem worth asking and the kinds of answers that seem worth having. Particular historical conjunctures, Scott goes on to explain, constitute different problem spaces and generate a new set of questions. I suggest that we think of imperialism as a problem space that generated a particular set of questions around religion, questions that differentiated between knowledge and belief, between public and private, between universal and particular – in short, questions that both operated on and were constitutive of what Asad calls a secular conceptual grammar. Crucially, the notion of imperialism as a problem space transcends categorical distinctions between colonizers and colonized: both were implicated in it and productive of its force, albeit in different ways. Moreover, the new questions generated in this space did not function by overwriting discursive traditions, but rather transformed them in such a way that they provided answers to questions that had acquired a new political salience. This conceptual approach, however, requires a methodology of reading across archives to understand both how discursive traditions were transformed and how imperial encounters with these discursive traditions transformed the very questions that were asked. The Kitchanukit provides an opportunity to trace this transformation of conceptual grammars more concretely. The Kitchanukit, published in 1867, was written by a royal official who was close to the reigning monarch of the time, King Mongkut. 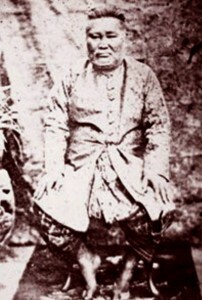 In nationalist historiography, Mongkut is still celebrated as one of the so-called modernizing monarchs who prevented Siam from being colonized through a strategy of Westernization. In a more nuanced understanding, however, Mongkut embodied and negotiated different knowledge formations. He spent the first decades of his life as a Buddhist monk, was fluent in Pali, and initiated one of the most important Buddhist reform movements, which became widely influential throughout the region. Concurrently, he learned foreign languages such as French, Latin, and English with missionaries and studied astronomy and geography. 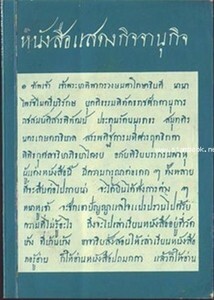 Mongkut, who was formally not allowed to directly address the public as their king, is suspected to have written parts of the Kitchanukit himself. เจ้า พระยาทิพากรวงษ์มหาโกษาธิบดี(ขาบุญนาค) หนังสือแสดงกิจจานุกิจ, กรุงเทพฯ : องค์การค้าของคุรุสภา (Thiphakorawong, Chaophraya  1971: Sadaeng Kitchanukit, Bangkok). Scholars in the Thai studies debate have largely interpreted the Kitchanukit as documenting a number of important epistemological shifts toward modernity that occurred in 19th-century Siam in reaction to imperial encounters. As its title indicates, this “Book about Various Things” indeed covers a large variety of topics relevant in 19th-century debates, ranging from different ways of reckoning time and mapping space to explanations about astronomy, the weather, and the religions of the world. An often mentioned and significant part of the Kitchanukit is, moreover, its refutation of the “three-worlds” cosmography, the so-called Traiphum, a cosmography that occupied a central place in the Theravada Buddhist tradition in Siam. More recently, authors have located the Kitchanukit, which is written in the form of a catechism, more thoroughly within missionary encounters and interpreted it as the work of Buddhist apologetics rebutting Christianity. My reading takes us into a slightly different direction, one that understands the Kitchanukit as operating within an imperial problem space and its constitutive secular grammar. In a revealing example, the Kitchanukit discusses questions of rainfall. It first describes the stories told about rainfall in three-worlds cosmography, the Traiphum, only to proceed by systematically putting these stories into doubt. There is no “proof” or “evidence” for them, it says, and we cannot assume that they are “correct”. Importantly, the Kitchanukit moves on to compare these unproven stories with those of different world religions. Starting with Chinese beliefs in different gods, it ends by challenging monotheistic beliefs in God the Creator. If there really were one merciful God who created the world, why does rain not fall equally everywhere so that everyone can make a living and eat securely? The Kitchanukit offers a more rational alternative here, which is to “follow the wise ideas of philosophers who have some proof of their theories” – and whose ideas are, crucially, compatible with Buddhism. According to the philosophers’ ideas, explains the Kitchanukit, rain is caused by distillation, which we can prove by considering how ponds dry up in the heat of the sun. I want to make a number of points here that bring us back to the notion of an imperial problem space and the kind of questions that it generates. One crucial question that seems to linger in the above account about rainfall in the Kitchanukit is that of scientific truth, which already incorporates the epistemological split between the epistemological realm of the “worldly” and “real” in contrast to the realm of “religion” – a split key to a secular conceptual grammar. Crucially, one of the answers the Kitchanukit provides locates the traditional Traiphum cosmography, together with monotheistic world religions, on the unscientific side of “religion”. Simultaneously, it produces Buddhism as a religion that bridges this divide by accommodating the scientific theories of modern philosophers. It is indeed this ability of accommodation that distinguishes Buddhism from other world religions, according to the Kitchanukit. Equally lingering in the background of this account is the question of differentiating and comparing different world religions, a question whose genealogy Tomoko Masuzawa has traced to debates in Christian theology in Europe and their transformation into an emerging science of religion. According to Masuzawa, the answer to this question would continue to confirm the supremacy of Christianity even in the seemingly secular and neutral discourse of the science of religion. Yet we encounter an important twist here: in answering the question about world religions, the Kitchanukit highlights Buddhism, not Christianity, as the uniquely universal world religion. The very category of religion used in the Kitchanukit plays an important role in this argument. Thus, the Kitchanukit uses the word sasana as an equivalent to the category of religion, a word derived from the Buddhist discursive tradition that literally translates as the body of Buddhist teachings and learnings. At first sight, sasana seems to have been lifted from its particular context and transformed into an empty universal: the Kitchanukit uses sasana as an abstract category that can be combined with different categories of particularity, such as sasana isuan narai (literally: the religion of Shiva and Vishnu) for Hinduism. On closer inspection, however, an understanding of sasana central to the Theravada Buddhist tradition plays an important role in this move. For sasana is a flexible category that explicitly includes what became marked as “scientific” knowledge, and it contains a normative component: the Buddhist teachings and learnings are feared to be in perpetual decline and therefore held to require continual nourishment and reform. Sasana in this sense cannot possibly translate into what would later become the universalized category of religion key to a secular grammar, a category decisively shaped by Protestant ideas of monotheistic religion as a set of beliefs in a set of propositions about transcendence that the individual gives assent to. The Buddhist sasana is consequently rephrased as an answer to two of the key questions operating in an imperial problem space, questions that concern the truth of science and the comparison of world religions. Through its answer, the Kitchanukit incorporates the secular epistemological split and repositions Buddhism as a religion supreme in both “religious” and “worldly” realms. Buddhism here becomes the uniquely universal religion/philosophy that has already transcended unscientific particularity and is thus rightly located at the apex of comparison hitherto reserved for Christianity. This epistemic shift to the Buddhist secular that I have traced in the Kitchanukit had profound political implications in 19th-century Siam. Its claims that Buddhism already contained the ultimate and universal truth helped to legitimize the sovereignty of the then-ruling Buddhist monarch. On the basis of these claims about correct, “modern” forms of Buddhism and “ancient” superstitions, the newly emerging state bureaucracy, moreover, started to strictly regulate religion and religious subjects in a way reminiscent of secular states – for instance, by incorporating the Buddhist monkhood into the state bureaucracy and cracking down on practices deemed “superstitious”. Vis-à-vis Western powers, it was this construct of the Buddhist secular that marked Siam’s modernity as equal in standard but different in its Buddhist essence – a discursive operation that would later enable a form of nationalism centrally grounded in official versions of Buddhist tradition. Scholars have analyzed the Kitchanukit as inaugurating Siam’s alternative “Buddhist” modernity. Instead, I propose reading the construction of such a “Buddhist modernity” as an inherently political project. It was mobilized through an imperial problem space and centrally based on and constitutive of a secular conceptual grammar. Of course, there would be much more to say about the Kitchanukit and much more to inquire. One part of the story that could still be told, for example, is how the Kitchanukit was translated into an English book called “The Modern Buddhist”. This translated version of the Kitchanukit celebrated the “modernity” of Siamese Buddhism and its doubting of Christian beliefs in Victorian Britain where the secularist movement was on the rise. It was widely read all over Europe, including Germany. Siamese monarchs themselves, moreover, became active agents in knowledge production on Buddhism in the West by, for instance, funding the research endeavors of Friedrich Max Müller, the designated founder of the science of religion. In conclusion, the example of the Kitchanukit neatly illustrates that Europe was not the sole originator of the construct of “Buddhism” as a world religion, nor of ideas of the secular. I have argued that imperialism operated as a problem space whose universalizing force was precisely built on implicating both the Siamese royal elite and Western missionaries. The questions generated in this space significantly transformed a discursive tradition in Siam that was later designated Theravada Buddhism. Yet, the replies provided in the Kitchanukit also influenced discussions about Buddhism as the original secular philosophy and therefore the non-religious, secular alternative to Christianity. Put differently, the seemingly universal concepts of the secular and Buddhism have an imperial history that led to a reconfiguration of the grammar of these concepts within global connections and relations of power. The case of Siam forces us to attend to this imperial history and continue conceptual discussions on possibilities for provincializing secularism. Thiphakorawong, Chaophraya  1971: Sadaeng Kitchanukit, Bangkok. Masuzawa, Tomoko 2005: The Invention of World Religions. Or, How European Universalism was Preserved in the Language of Pluralism, Chicago. Scott, David 2004: Conscripts of Modernity. The Tragedy of Colonial Enlightenment, London.